Medicinal distilled cow urine (200 ml), produced by ISKCON Belgaum goshala, from native Indian breed of cows. According to Ayurveda, distilled cow urine is the best medicine for all diseases. It is a miracle cure for every disease. 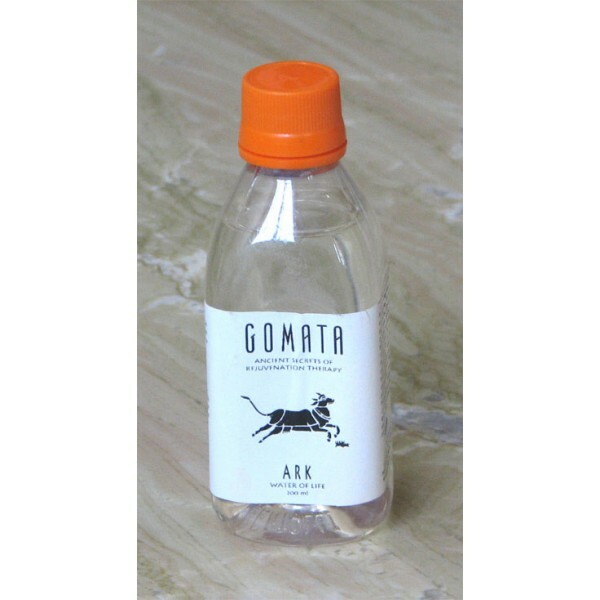 Produced and distilled according to the ancient Ayurvedic process by devotees, from protected cows. Increases resistance power of the body. Increases life span and purifies the blood. Effective for all kinds of diseases. Restores balance of the "three doshas". Take 2 teaspoons with honey or water, 30 minutes before or after food. Ammonia (NH3): Stabilise bile, mucous and air of body. Stabilises blood formation. Copper (Cu): Controls built up of unwanted fats. Iron (Fe): Maintains balance and helps in production of red blood cells & haemoglobin. Stabilises working power. Urea CO(NH2)2: Affects urine formation and removal. Germicidal.